Whimsy Press - Creepy Cool! A big thanks to Donna from Whimsy Press for sending along a few images of their fresh new creepy designs. Modern Garde, Femme Fatale, Dude Wrap... Now you can gift all the characters in your life with wrapping paper that best suits their personality. Are you pals with a Jeffrey or Alison type (from Project Runway)? 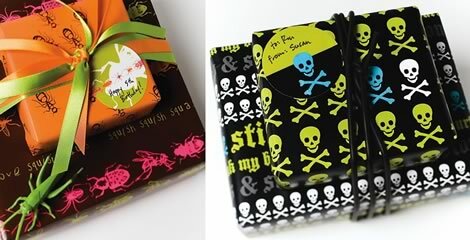 Try that fun skull wrap for him, the pink for her. Have a present for your 8-year-old nephew? That buggy pattern (below) will fit him nicely. Whimsy Press has such playful patterns, it's fun to spot something so unique for a change, as well as wrapping paper that you can actually give to a guy without them looking at you like, "yeah, right". Thanks again Donna for sending these our way. We love 'em! Elsewares: Calendars and Plates to Love!